Received your request for the FM-21s. I'll keep you posted on the status of the deal with Ed Clegg. We have had many problems running packet radio on 2-meters in the NYCINJ area. Seems that people treat frequencies as personal territory!!! It makes a lot of sense to expand into the 220 MHz band. One of us (AD71/2) is experimenting with direct FSK on 220. 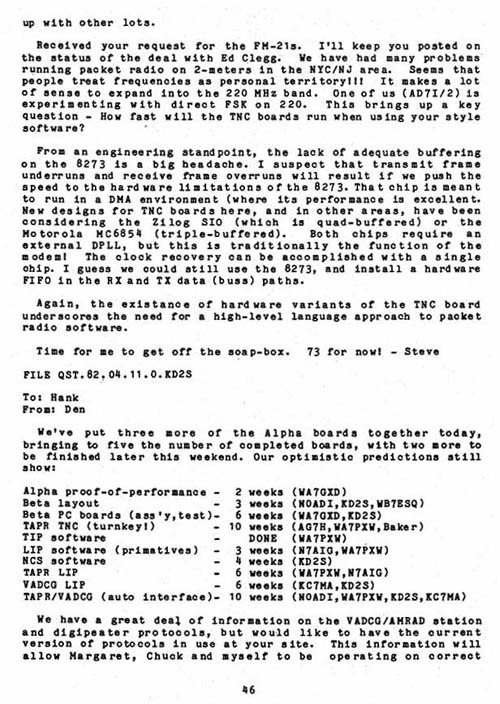 This brings up a key question - How fast will the TNC boards run when using your style software? From an engineering standpoint, the lack of adequate buffering on the 8273 is a big headache. I suspect that transmit frame underruns and receive frame overruns will result if we push the speed to the hardware limitations of the 8273. That chip is meant to run in a DMA environment (where its performance is excellent. New designs for TNC boards here, and in other areas, have been considering the Zilog SIO (which is quad-buffered) or the Motorola MC6854 (triple-buffered). Both chips require an external DPLL, but this is traditionally the function of the modem! The clock recovery can be accomplished with a single chip. I guess we could still use the 82739 and install a hardware FIFO in the RX and TX data (buss) paths. Again, the existence of hardware variants of the TNC board underscores the need for a high-level language approach to packet radio software.